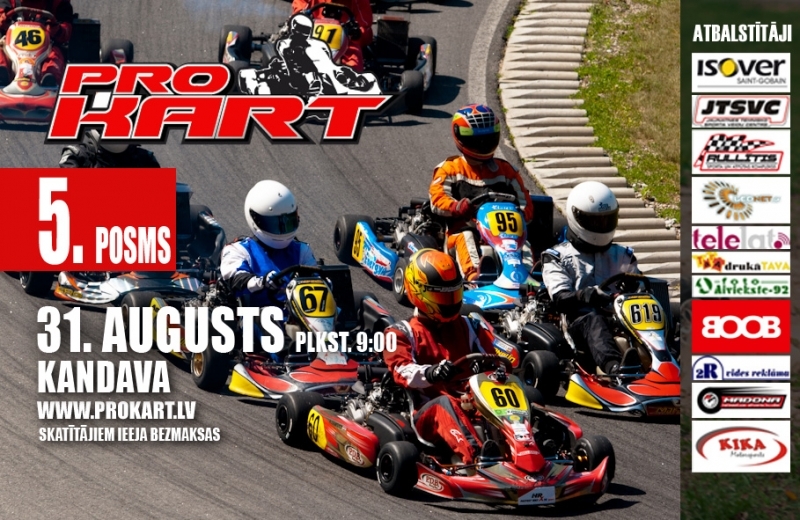 In Kandava this Saturday 31st August will be held Pro-Kart final stage of the season. In each class will be play out another 50 points, for this reason, none of the current standings leaders can feel confident that the championship cup is in hands. It is expected that competition attended by over 150 members of the Latvia, Lithuania, Estonia, Russia and Germany. If in the previous competition in Madona among participants was found only one German Go-Kart driver, in Kandava it is expected more than one representatives. Also the participation in the event is confirmed by Kaliningrad Go-Kart drivers and new sportsmens for Pro-Kart from Lithuania and Estonia. Preliminary registration will be closed 28.08.2013. at. 00.00. Free practice starts on Thursday at 10:00. Free practice session continues on Friday, as well afternoon will be possible to make registration for the Race and scrutineering. Saturday race heats all the day until about 18:00. More detailed Timetable You can find under tag "Races" and "Regulations". Traditionally under this competition will be held race heats for rental Go-Kart class Energy TK also. The coordinator is Marek Štolcermanis 371-26003372 . Here can participate any rider, under regulations like rental Go-karts have. Entry fee 40LVL. Participation fees for all other classes are as usual, of course, spectators free admission. Liels paldies organizatoriem ka atrada iespeju MiniMax klases braucejiem braukt atseviski . Еще раз уточню - по часовой или против?! пс. Если против часовой (класический вариант) то по чему решили не запустить в другом направлении? Едем как обычно - против часовой стрелки, или обратно?